Why create the labyrinth, who will experience it and how will it be used? Just as setting an intention is good practice before beginning a labyrinth walk, the same is true for building a labyrinth. Pause and consider the energy you want to infuse into the project and the spirit you hope the labyrinth will evoke. Imagine the ages and abilities of people who will visit the space and whether they will be individuals or groups. A dedication or blessing prior to drawing the first circle is good way to prepare the workers and site. Sacred objects can be placed on a center altar to connect the labyrinth with the people, places, or purpose surrounding it. Where will the labyrinth be located and how will it relate to the environment? 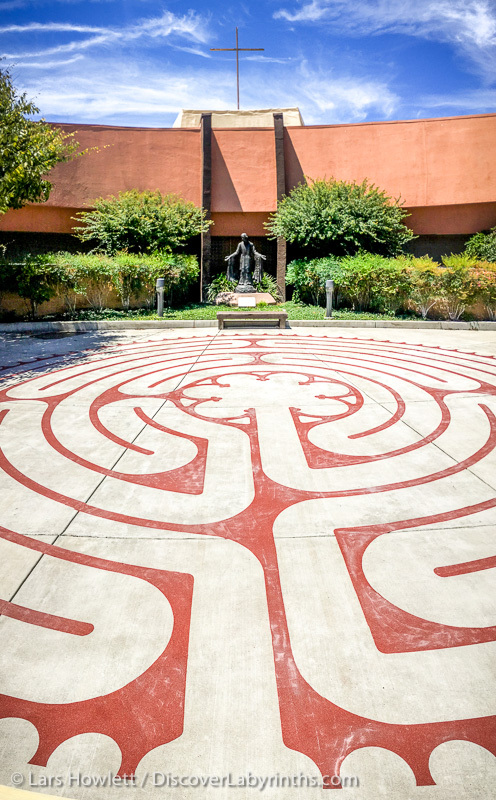 Labyrinths create sacred space and an invitation for people to take time for themselves. The setting should act as a container—cradling people to allow for an introspective experience while also allowing room for thought. 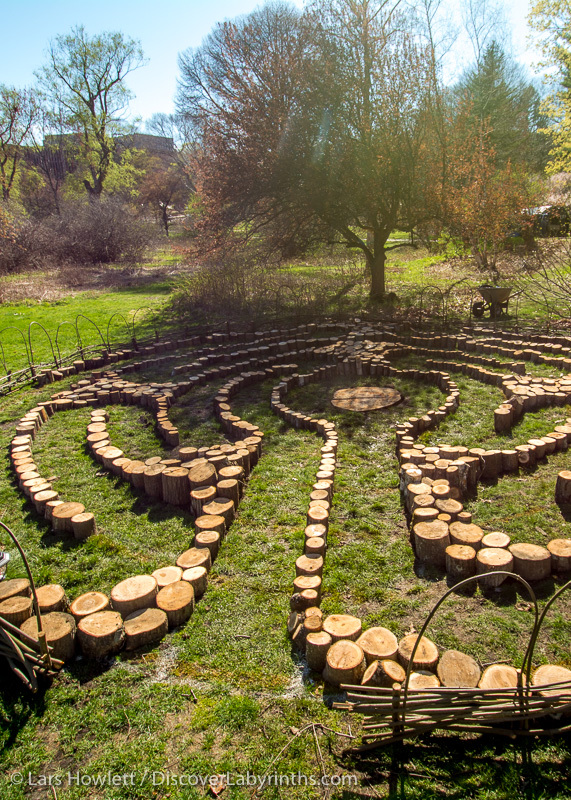 Consider whether the environment will benefit from the labyrinth as much as the labyrinth will benefit from its surroundings. Dowsers can aid in discerning the energy and obstacles of a space. The orientation is also a key consideration as it will determine the location of the entrance and view upon entering the center. Don’t just look at a potential site, listen, and consider the cycles of the seasons. Consider the pathway and accessibility of the labyrinth and features such as signs, benches, lighting, drainage, and other features. What people, tools, materials, funds, organizations, etc. are available to support the project? Many elements come together to realize a vision. Consider all available resources and be open to unexpected offers and synchronicity. Form a founder’s group or committee and identify the additional key people who are required to bring the labyrinth to fruition. Consider how you can best employ your contacts, funding sources, and local entities. Share your intention with others and empower them by asking how they might help provide this gift to the community. Creating a temporary labyrinth or facilitating walks on canvas can help educate a community and provide a sense of progress. Which pattern, how many circuits, and what variation might be most appropriate? While you may begin the process with a particular design in mind, you may wish to expand the range of possibilities to include other patterns or variations. Carefully consider which labyrinth best suits your intention, site and resources. The 11-Circuit Chartres Labyrinth, for example, has 5 and 7-Circuit variations that are useful when space, materials, money, and expertise is limited. Classical, Processional, or neo-Medieval designs offer different benefits. For challenging sites a custom design could make the most of an unusual space. There is a wealth of contemporary patterns worth exploring, although many novice designs (and even some by architects!) lack important principles of symmetry, balance, and sacred geometry. One important decision will be whether to prioritize the width of the paths or size of the center. What will form the lines, the paths, the perimeter and the foundation of the labyrinth? The objects that form the labyrinth and path will have a great effect on its feel, cost, and longevity. Often less expensive materials require more maintenance and care, while hard-surface labyrinths are more expensive and enduring. Precision is possible with an investment in cut stone, pavers, or cement, while bricks, wood, or river rock lend a more organic feel to archetypal patterns. Consider how the materials reflect the spirit and energy of its environment. Local, reclaimed, or found objects, can help connect space to place. Take a tour of local labyrinths (search labyrinthlocator.com) to experience a variety of designs, settings, and materials. Who will create the labyrinth and what is the optimal strategy and timeline for completion? Labyrinths can be created as simply as a single person drawing in the sand to an assortment of volunteers, professionals, contractors, and other hired hands. 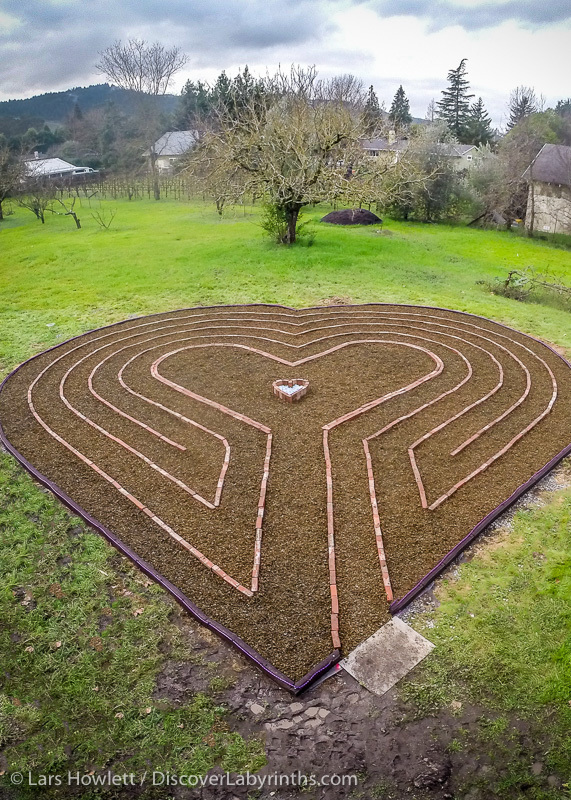 With more complicated patterns (like Chartres) or refined materials (like paint), a professional labyrinth designer or builder can achieve greater precision and efficiency. Labyrinth builders can also help consult on all aspects of the design, materials, plan, budget, and site preparation. Volunteers can be enlisted to save money and instill greater personal investment in the community. Weather can often affect the speed and spirit of an installation, so aim for a mild and dry season and don’t be afraid to postpone if storms are forecasted. What is the expected lifespan of the labyrinth and who will tend to its health and vitality? After being birthed by a community, labyrinths will lead a life of their own relative to the people, place, and energy that engages them. It’s a good idea to identify a ‘labyrinth keeper’ or committee that will visit the space on a regular basis and tend to its needs. Monthly events like full moon walks help to keep the energy moving and even seasonal (quarterly) or annual walks make a big difference in the labyrinth’s longevity. Depending on the material, climate, and frequency of use, labyrinths will season differently. Ensure that the pattern does not get obscured by weeds, dust, fading, or kicked stones, but accept that in other ways there is a beauty in aging and allow the space to evolve over time. Handout created by Master Labyrinth Builder Lars Howlett with feedback from my mentor, Robert Ferre. Download this reference as a PDF to share with your committee, community, or congregation.